If you are having other ‘Ok Google’ related issues on your Pixel 3, 2, or 1, try out the steps mentioned in this article. Unlocking your phone with the “Ok Google” voice command – a feature officially termed as Voice Match – is a Google Assistant functionality that Pixel phones come baked with. At least, the original and second generation Pixel phones provide this option. But things appear to have changed on Pixel 3 devices. What’s now coming to light is that Google has tweaked the way Google Assistant functions on their newest smartphone edition. Now, instead of unlocking the phone with voice command, Pixel 3 users can access Google Assistant directly on the locked screen. How? The newly added ‘Lock screen personal results‘ is the option that allows Pixel 3 users to control what they want to see on lock screen – like emails, calendar, reminders and more – and what not. On Pixel 3 phones, you can’t unlock your phone by saying “Ok Google.” Instead, you can use the Google Assistant on your lock screen. The support page also warns users that unlocking device through Google Assistant (using Voice Match) can be a little unsafe, as similar voices could be a limitation here. 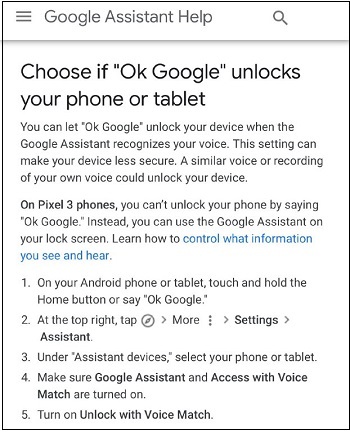 You can let “Ok Google” unlock your device when the Google Assistant recognizes your voice. This setting can make your device less secure. A similar voice or recording of your own voice could unlock your device. We’re not sure why the company has deprived only their newest flagship users from one of the basic and loved features. What’s your take about this change? Drop us a comment and let us know.